COLUMBIA, MO – After another disappointing loss in the Southeastern Conference to the University of Florida this past Saturday, many Missouri fans found a target of blame: junior quarterback James Franklin. Franklin threw four interceptions in Gainesville, Florida, as the Tigers lost by a score of 14-7. The Tiger fan base has been placing a lot of blame on him due to the impressive performance of the rest of the team. Missouri outgained Florida in terms of yardage and also had the ball longer for the game. They converted more third downs, as well as earned more first downs. The only category they were outplayed in was turnovers, due to Franklin’s four. Even with that though, Missouri student Mike Bonomo thinks the Tigers should stand behind Franklin. Mike Bonomo (pictured) browses on his laptop in the MUTV studio on Nov. 6, 2012. 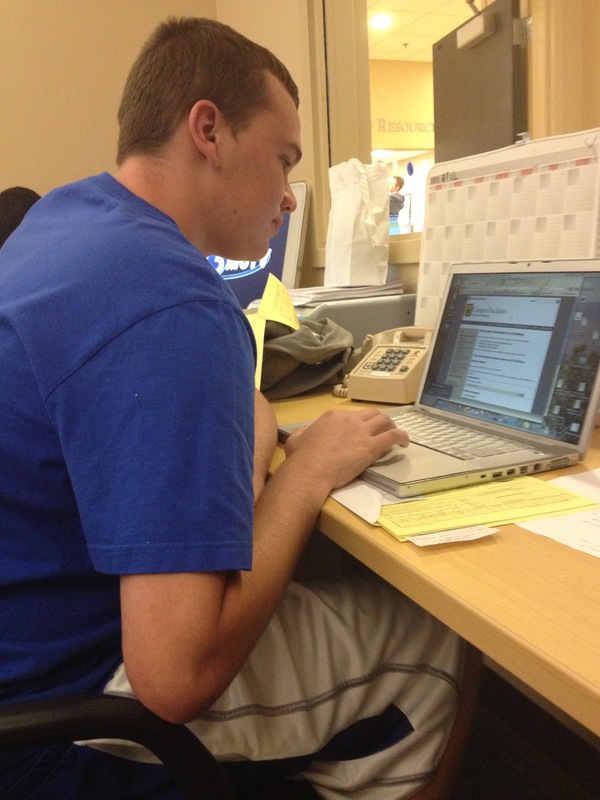 Bonomo, a freshman at the University of Missouri, works in the sports section at MUTV, a student broadcasting organization at Missouri. “I think he’s the most talented quarterback they have, as well as a good leader,” Bonomo said. Bonomo, a freshman journalism major, thinks Missouri fans should not forget about the knee injury Franklin sustained earlier this year against the Vanderbilt Commodores on Oct. 16, 2012. He thinks it had an effect against Florida. 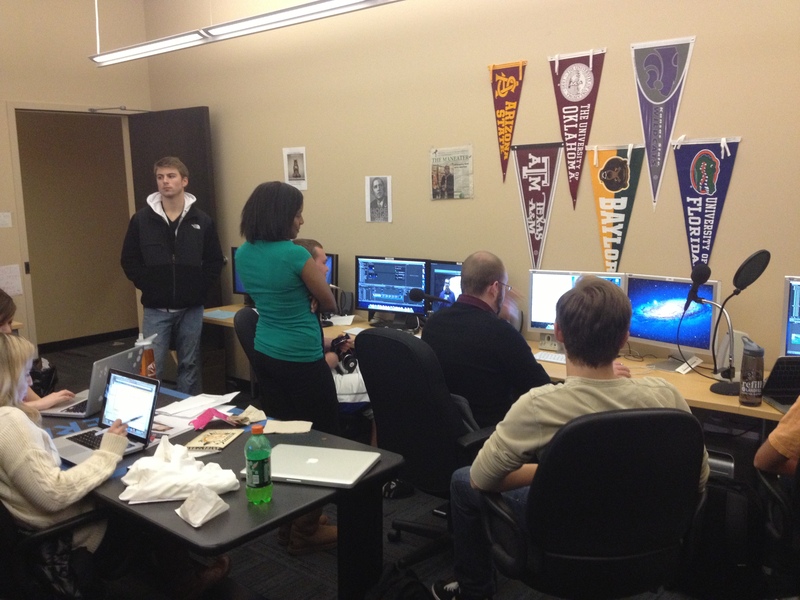 Students at MUTV prepare for the sports programming being filmed at their station on Nov. 6, 2012. James Franklin figures to be a major topic of discussion on the shows. Franklin is still first on the depth chart at quarterback, but time will tell if the supporters like Bonomo, or the detractors, win out.